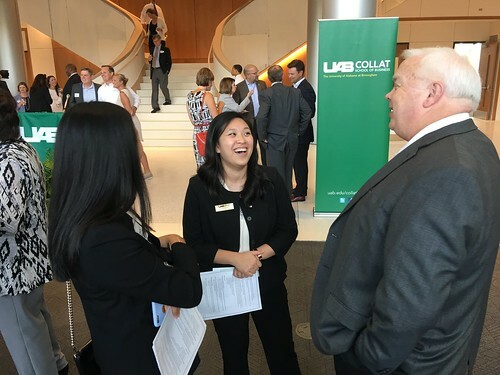 More than 160 people visited the new Collat School of Business and Harbert Institute for Innovation and Entrepreneurship building July 26 for a preview party celebrating the project’s major donors. University officials and Collat School of Business faculty and staff celebrated the donors’ contributions during a reception in the facility’s new Medical Properties Trust Commons, followed by self-guides tours of the building. Excited visitors were able to tour student spaces, such as the Career Center, Welcome Center and Student Success Center, as well as academic, study and administrative spaces. The school plans to move into the new building in early August with an official Ribbon Cutting Ceremony, open to the public, scheduled for August 24 at 10 a.m. Follow the school’s Facebook account or the hashtag #ExploreCollat for building updates.